Soak blackeye peas with enough water to cover by 2 inches overnight. The next day, drain and set aside. Dice bacon into roughly 1/4 inch pieces. Add oil and bacon to pre-heated thick bottomed pot or dutch oven. Cook until crisp, stirring regularly to avoid burning. Remove bacon with slotted spoon and set aside. Add Andouille sausage to pot, and sauté Andouille in bacon fat until browned. Add onions and celery and cook until slightly browned and translucent, stirring occasionally. Add garlic and cooked bacon. Cook 1 minute, then add stock. Stir to make sure nothing sticks to bottom of pot. Bring to a boil and add the tomato paste, bay leaves and soaked blackeye peas, along with a pinch of kosher salt. Stir and return to a boil. Reduce heat, cover and simmer about an hour, stirring occasionally. Adjust seasoning to taste, discard bay leaves and keep warm. Season shrimp with salt and pepper. Mix the parsley, thyme and red pepper flakes in a small bowl and set aside. Heat oil in a skillet over medium-high heat. Add shrimp and cook for about a minute. When the pan side of shrimp begins to take on a red color, flip shrimp and add minced garlic and herb mixture. Stir and cook for another minute. Add the wine and lemon juice, and simmer until shrimp are firm, about 2 minutes. Remove from heat, add softened butter, and stir until the butter dissolves into the wine. 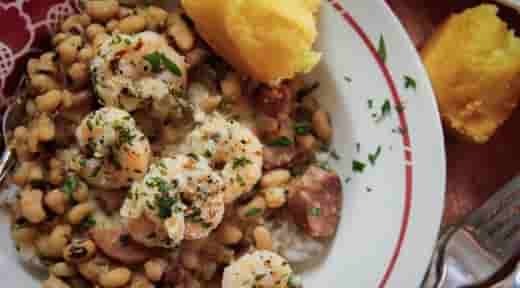 Serve shrimp over blackeye peas and rice, topped with the butter & white wine pan sauce.